Meg Daly’s Celtic baking is one of my favourite reasons to go to the Hamilton Farmers’ Market on Sundays. In my house we’re huge fans of her Scottish oatcakes, and we’re sadly disappointed when they sell out (though this gives you some idea of Meg’s popularity). This food pushes “homesick Celt” buttons that I barely knew I had. Many New Zealanders have an Irish or Scottish granny, Meg says. (Actually, my Celtic whakapapa is Welsh.) Even the traditional Maori rewena bread – that was originally Irish soda bread. Celtic baking resonates with people on all sorts of levels, she says. “I get people in their 80s, who say, ‘my grandmother used to make those’.“ And some people have told her they know about Welsh cakes from the Welsh poet Dylan Thomas, who mentions them in Under Milk Wood. Meg loves listening to people talk about food, and says she doesn’t get to do this as much as she’d like because the market is so busy. 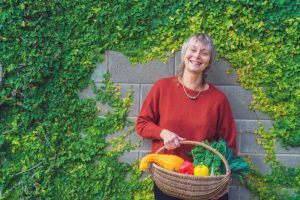 But when I went out to visit Meg at her Te Kowhai home I found that Celtic Cuisine is just the tip of the iceberg for this creative cook and gardener. There’s a vege garden flourishing in the depth of winter. There’s a gully that Meg is laboriously reclaiming from blackberries and replanting in natives. And several tunnel houses containing passionfruit vines, tamarillo bushes and 50 araucana chickens, who produce pretty blue eggs. There’s an orchard of young fruit trees. And there’s a row of extra-large worm bins – Meg is part of the “City to Soil” food waste recycling programme, where people bring her their kitchen scraps to turn into fertilizer. She often gets people suggesting she expand her business beyond the Waikato farmers’ markets. “When you come up with something really nice and it’s a little bit different…” But growing the business would be a mixed blessing, she says. It would mean she’d be spending more time on the baking, and have even less time for her garden. More money doesn’t mean being happier, Meg says.